Drenchers and Sun Shower are pretty good at helping me make my daily vitamin and mineral requirements while helping to fortify my health. Check out the review. Buy It: Shop online for Drenchers Juices! 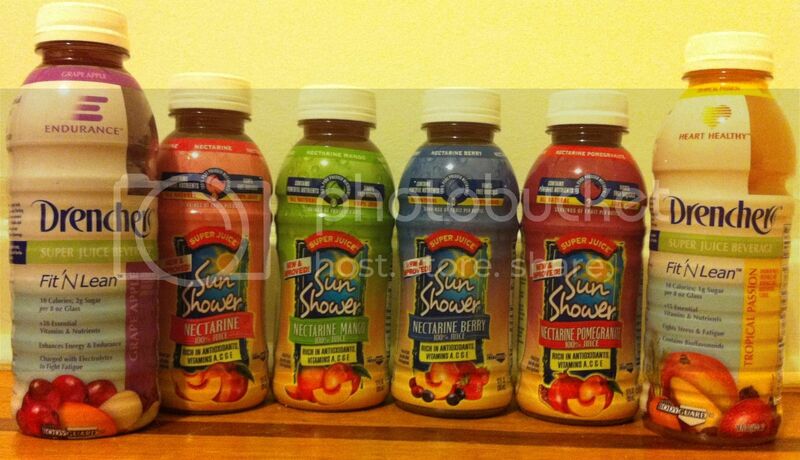 Win It: 1 Whirlwind of Surprises' reader will win a pack of Drenchers Juices ($25) for themselves. Open to US. Good luck! I am a fan of V8 juice! I also try to eat a piece of fruit first thing in the morning. Even still, I just don't manage to get enough produce in my diet. I eat lots of fruits and vegetables. We eat lots of veggies! I take a daily multivitamin ヅ *Thanks* for the giveaway! I try to fit in 6-8 servings of fruit and vegetables per day. I try to stick to a well-rounded diet and when I don't, I take a multi-vitamin. (Quanda) Eat fresh fruit salads & take my vitamin. I take a daily multi vitamin and eat lots of fresh fruits and vegetables. I take multi vitamins and eat veggies and fruits:) Not as much as I'd like to though! I try to get enough Vitamin and Mineral in my diet by eating fresh fruit and veggies when I can and taking a daily multivitamin.